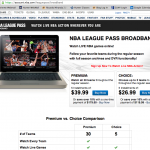 UPDATE: After requesting a refund for my purchase of NBA League Pass Broadband, the purchase was promptly and fully refunded. However, I still consider it fraudulent that on the offering page it is not clearly articulated that only some games will be available. 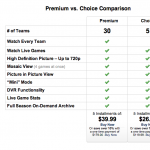 Instead the offer misleads the reader to believe that all games of the teams that one selects will be available. Therefore, I’m leaving the article below unedited, because people should not be mislead into a bad purchase. I don’t have a television, so I don’t have cable channels such as TNT nor do I have network channels such as ABC. I would like to watch NBA games without having to watch poor streams from Europe or walk to the neighborhood bar. 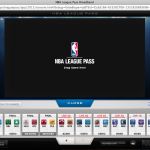 So when I saw the NBA League Pass Broadband that would allow me to watch 5 NBA teams play live games in high definition picture, mosaic view – 4 games at once… I paid the first of five installments of $26.99 to select 5 teams to watch live online. Below is the offer that I signed up for. 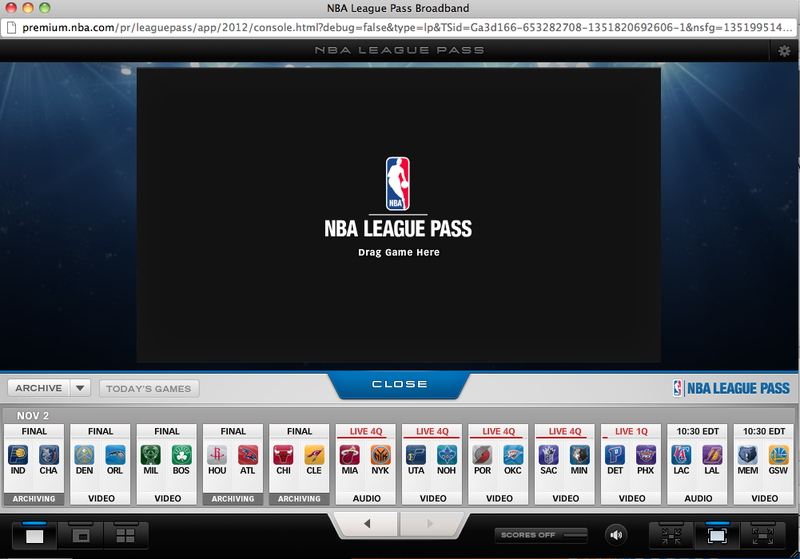 After I paid, I logged in to watch OKC versus San Antonio, but I couldn’t watch the game, I could only listen to it. 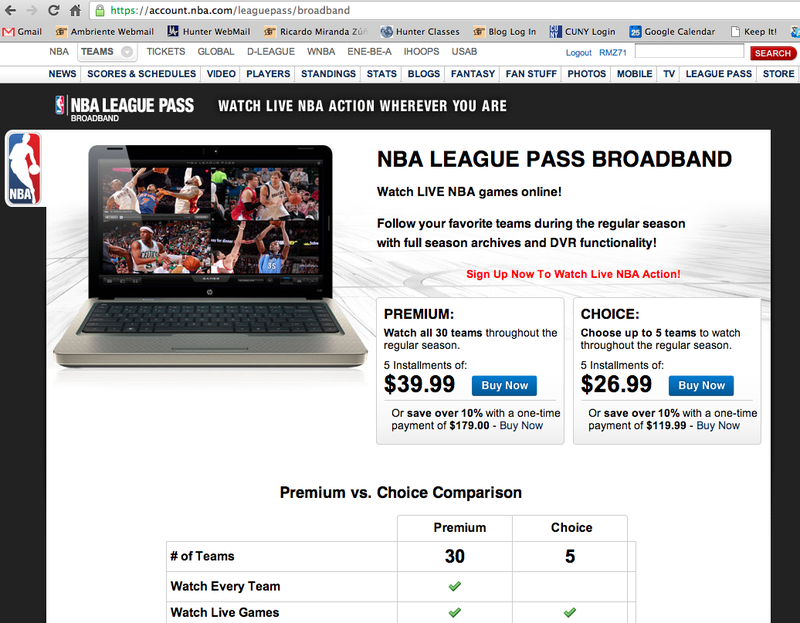 The screen told me to watch on TNT, so I went to the TNT website thinking that perhaps I could watch it there with my new $27 a month league pass. But I couldn’t watch it online there either. I needed a television with cable to watch the game on TNT. Today, I wanted to watch the Knicks versus Heat and once again, I could only listen to it. Later, I’d like to watch Lakers versus Clippers, but that is also available as audio… I can’t watch it via broadband live as advertised. 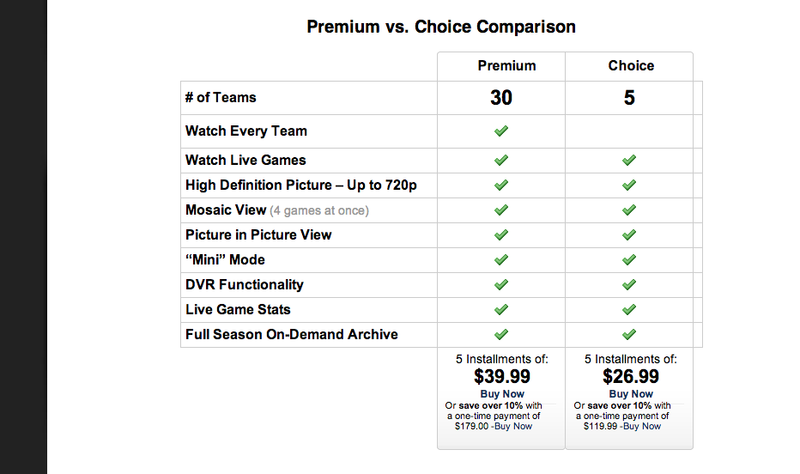 Below is the screen of my choices… the two games that I’d like to watch are only available as audio. 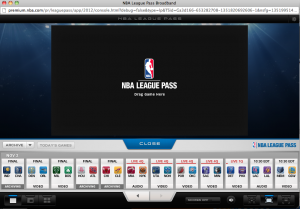 NBA LEAGUE PASS BROADBAND IS A LIE. Of the three games that I’ve wanted to watch in the 24 hours since paying $27, not one is available as live broadband video. Don’t give them money, just watch the free European feeds, they work and they are free! I just watched the Knicks wrap up their win over the Heat via European feed. I want my money back for the service that you offer but fail to provide!